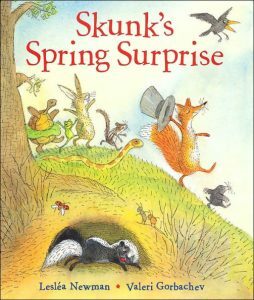 When Skunk wakes from her long winter nap, she can’t find her friends anywhere. Maybe they think she stinks. Maybe they have a surprise for her. Or maybe she has a surprise for them! I had so much fun writing about the characters in Where Is Bear? that I decided to put them all in another book. Plus, winters here in New England are long and cold and I wanted to write about spring, something we all look forward to. Skunk wakes from dreaming of her friends. then jumps right up and makes her bed. “Hooray! My winter nap is done! the scurries off to find her friends….